Learn more about The Revolution Where You Live: Stories from a 12,000-Mile Journey Through a New America. Download photos of the truck & camper, the book jacket, and the author. 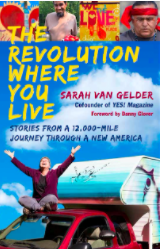 Learn about the author, Sarah van Gelder, and find some of her talks and interviews. Read the Foreword, “Chaos or Community,” by Danny Glover. Contact Sarah van Gelder. Sarah speaks about the themes from the book, especially the power of local communities to take on climate change, economic rebuilding, and racial injustice. Her work is also available for syndication and republishing.